Back by popular demand, another C64 challenge. There's a lot of info here, so make sure you actually look over it. There's no specific theme this week, instead you must only use 4 colours out of the available 16. Your piece does not have to adhere to any particular C64 restrictions (these are detailed in the links below). However, it must use one of the palettes shown below - either Pepto's palette, or Ptoing's adjusted version of that palette. Optional Bonus Challenge: Use correct mcol (multicolour mode) restrictions - this means create the image using double width pixels. See the first link below for more information on different modes. Colours - Exactly 4. Pick 4 colours from one of the 16 colour palettes below. No palette swapping, you either use Pepto's palette or Ptoing's palette. 1) you shouldn't use colorramps that have both green/pink and med. grey/lt. blue. they're too similar in brightness. It looks best when you only have one color of these four. this is also the reason why med. grey is the most potent color, like ptoing says, since you can replace the other three colors when you need to! 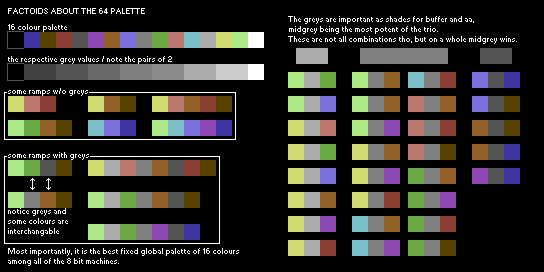 2) you can mix the colorpairs linewise, and on a real monitor (or with PAL emu) they blend into one single color, e.g. blue and brown become a very dark grey. 3) The differences in brightness of the color pairs look linear on first glance, but they're not. the darkest six colors f.ex. (brown/blue, dark grey/red and orange/purple) are very close in luma, but the next brightest colorpair (med. grey/lt. blue) is a much bigger jump. There's also a rather big jump from pink/green to lt. grey/cyan! mods are always here when the challenges end/begin, and we make sure to check for last-minute entries. I'd advise not cutting it extremely close to the deadline though, because if you've overlooked a rule you'll have no time to revise it. hmm, i just finished and submitted, if it gets accepted theres still time right? Like, i didnt miss the time limit or anything cause i submitted the day the challenege ends? Must preview obey the rules? I was thing about making preview animated and use other colors from same palette in it. Exactly 4 means exactly 4. Two separate options for this challenge over at the challenge checker--one for each of the two palettes. Don't panic if you don't pass! You probably just have the wrong one selected. Can I use only one color? I know it says "exactly 4" but is it OK if i do a B/W Multicolor entry? É só criar um desenho de 320x200 com 4 das 16 cores apresentadas em uma das paletas. Esse bônus do tal mcol é pegar os pixels e deixá-los com 2px de largura por 1px de altura. C64 (Commodore 64) é um videogame, caso não saiba. Então acho que fazer o desenho de um jogo seria mais aceitável. Ok ok, so I can't read. I've written a FLI encoder and a CPC raster modes checker, so now I get it all mixed up. In character mode, yes. But character mode isn't multicolor. One of the 3 per-block colors has to be 0-7 ? I didn't know that. Ah, great thread :o I wish I saw that earlier; not sure how I missed it. There is this, tho I don't think this is very helpful for the average pixeller. The normal C64 modes are quite easy to comprehend I think, hack modes less so. I started this guide at Pixelation which describes all the gfx modes the C64 comes with out of the box without any advanced programming involved. Fair point, I suppose. But I don't necessarily mean just mcol or just for this challenge. In general, is there a site that has good/easy to understand descriptions of C64 graphical restrictions? If you wanna do Mcol you need no link. Using widepixels and the proper resolution and only 4 colours will always produce a valid C64 pic. Eu nao entendi esse desafio...sera que alguem poderiam e explicar em portuges? What would be a better link to use? That link with the restrictions is very confusing and not very helpful. Proper MCol basically is: 160x200 widepixels, one global background colour (imagine it like drawing on a coloured piece of paper) which can be chosen from any of the 16 colours, and in each 4x8 widepixel block you can have 3 colours on top of this. So this means as long as stuff is only 4 colours it will always be proper MCol anyway. If it's something you do several times, it get tiresome after a while - I remember when I had to change the grid to 16x16 every time I started Grafx2, in the DOS version. Oh wow, this looks like a ton of fun! Yus! I'll be sure to enter this! 2 pixel wide brush and grid on is what I use in Pro Motion when doing my Amstrad CPC wide pixel graphics and works very well. To make sure the the pixels are correct with none misaligned yeah just half the whole image 50 percent and double it back again to original and it should all be fine. Yeah, coz taking 4 seconds to double the width of an image after 5 days of painting is sooo crazy! ;) But If this challenge used full C64-restrictions there's no doubt a dedicated C64-editor would be very useful. Another option is to pixel-push with a wide brush and a 2 pixel grid-snap. All questions are welcome. The simplest way is to load the image that has the target palette, change the size, "Save as" the name of your new work image, and only then you start pixelling. The 2.3wip version also supports cut-n-paste in Palette screen (select a range, ctrl-c). I see a misuse of the word "factoid". Sorry for being a noob with all the questions, but how do I load a palette into Grafx2? @Flarfy - They are slightly different and there is no actual set C64 palette. We used Ptoing's palette for the last C64 challenge exclusively and I thought it would be good to mix things up a bit. I still wanted to include Ptoing's version though, as I think it is a great palette. I feel that Pepto's palette is slightly harder to use, but it's an equally valid alternative if you want to try out a different, perhaps more challenging palette. Grafx2 can allow you draw in wide pixels natively: Click screen size, choose pixel size Wide or Wide2. Note that you should then use an canvas of 160x200; and before submitting to PJ, for browser compatibility you should revert to square pixels (Normal, Double etc.) and stretch the image to 320x200: Right-click Adjust, Uncheck 'Lock proportions', Set X: 200% (Or X: 2:1 Ratio), and click Resize. Ptoing's is Ptoing-calculated. Basically Pepto is less saturated, and they may each suit different things. I know that in Photoshop you can change aspect ratio to 2:1, not sure any others. Another way is to pixel at half width, swapping back and forth frequently. Why are there two palettes? What's the actual difference? I can see they have slightly different colors. But why? *edit* Also can Grafx2 or any other relatively user friendly program paint with wide pixels? Mm, good point. I originally had it written as 'use widepixels', but I wanted to mention 'mcol' since that's what it is. I'll make a note of it. The optional rule is strange, because as long as the picture uses wide pixels, it will be valid MCol.